Home E-commerce Online only startups competing with high street names: Can it be done? Long gone are the days when simply setting up a website was enough to give you a head start on high street retailers. 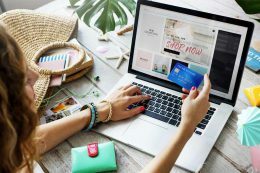 Many of the biggest names on the high street (not all, mind) are operating slick online operations as well. And, let’s face it, a known brand (whether a high street store or huge online player like Amazon or ASOS) has a “trust” factor for many consumers. It’s a tricky time to start an e-commerce business. Amazon owns so much of the market and both SEO and paid search have become fiercely competitive spaces over the past decade. So you either need deep pockets, a lot of patience or a combination of the two in order to get established in many cases. But can it be done? And if so, how? We caught up with one such business at the start of the journey. Linenbundle.com has only been operating for a few short months. Competing in the tremendously competitive luxury bedding space, it specialises in high thread count linens. That pitches that site online against brands like John Lewis, Dunelm and House of Fraser, phenomenally established names in homewares. In just a short space of time, the site has established several hundred 4 and 5 star reviews on third party websites and has secured praise in the likes of the Independent and an international edition of Vogue. So how is it competing with established names in the space? “We only sell high thread count bedding. That’s it. John Lewis, House of Fraser, Dunelm, Wayfair… all of those sites are sites you might go to for almost anything for the home. We just do bedding. And that enables us to focus on making sure our bedding product is the best in class and is super value as well. Perhaps the most intimidating aspect of launching in a space dominated by established brands is the potential depth of their marketing budget. And it’s something acknowledged by Linenbundle.com’s other co-founder, Paul Nesbitt. “We have to be careful. Paid search could be almost a bottomless pit for us. You could bid all day long. But we’re being very selective. We’re only focussing on a handful of specially chosen queries and limiting budget carefully. We’re spending a lot of time analysing conversion data and fine tuning constantly to minimise waste. The brand also focuses time and resource into the overall experience the customer has and acknowledges that word of mouth will always play an important role in the business. “Winning a new customer through SEO or paid search will always be more expensive than winning a new customer because their friend told them about this amazing product. And if we can build word of mouth in the way we have been doing, then we start to look at incredibly cost effective customer acquisition in the long term. As well as investing in the product itself to ensure quality is right, the founders of Linenbundle.com spent time on ensuring the packaging was standout, that delivery would be timely and there are memorable touches in the parcel itself. “We put a little postcard in with all our packages. It’s a simple thing showing a Lionel Richie inspired illustration with the words, ‘Hello, is it sheets you’re looking for?’ It’s an inexpensive little touch and surprises people. Both co-founders agree that they’re confident in the future of the business and the early sales figures and customer feedback give them good reason to be. “We’re realistic. We’re not aiming to have a John Lewis turnover in year 3! We’ve set goals that are a solid combination of achievable and ambitious. And we’ve based it on our own knowledge of the marketplace and our own business projections. That’s absolutely critical. Next articleDo high street bookmakers have a future?